Better late than never, right? 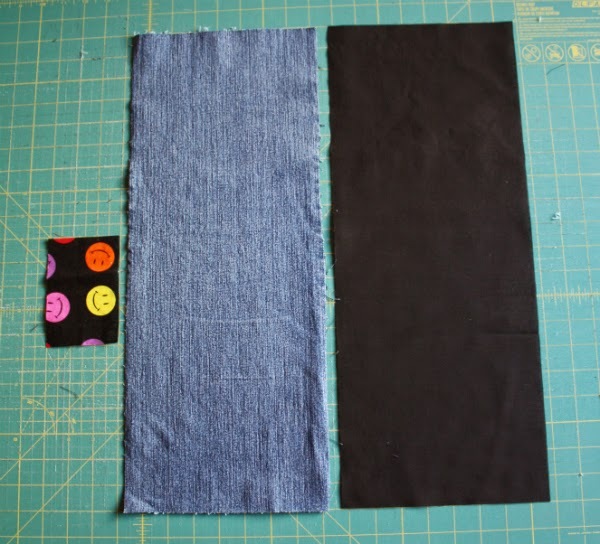 Back in November, when I posted my tutorial for the Bean Bag Toss Game, I said I would post the tutorial for the denim pouch "in the next few days." Well, a few days turned into a few months, but here we are - finally! 1 piece of denim 9" x 20". I cut up a pair of old jeans and used the back of one leg. Often the front of the leg either has holes in the knees, or the fabric at the knee is stretched, so it's hard to get a piece long enough from the front, but the back words great. 1 piece of lining fabric 9" x 20"
1 piece of fabric 3" x 4 1/2" for the handle. I used the same fabric for the handle as I used to make the bean bags. With the wrong side facing up, press in 1/4" on both short sides. Press in half along the long side, then open again. 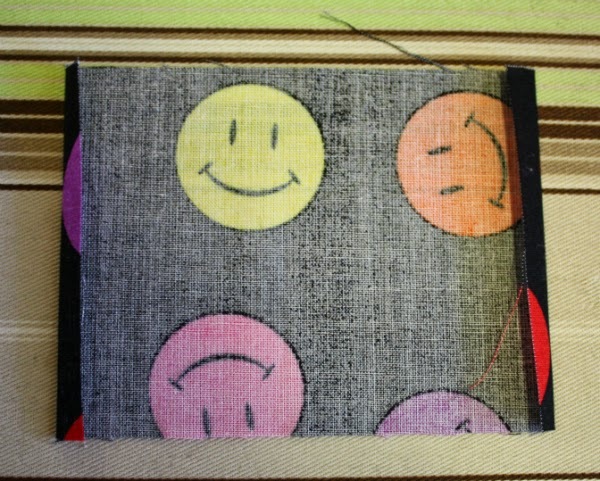 Fold both sides in to the middle crease and press. Fold in half and press again. Stitch close to the edge along the long side. 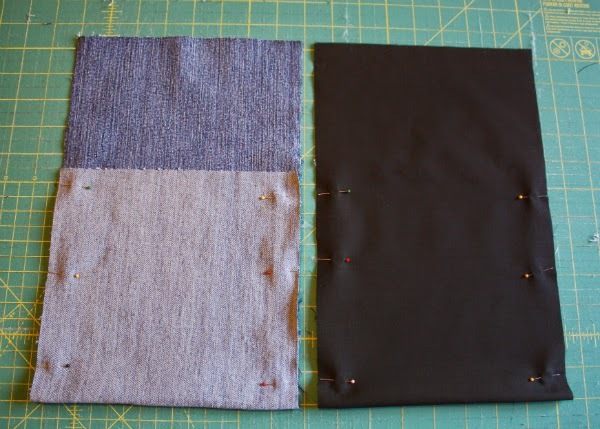 Don't worry about sewing the short sides now; you'll do that when attaching the handle to the pouch. 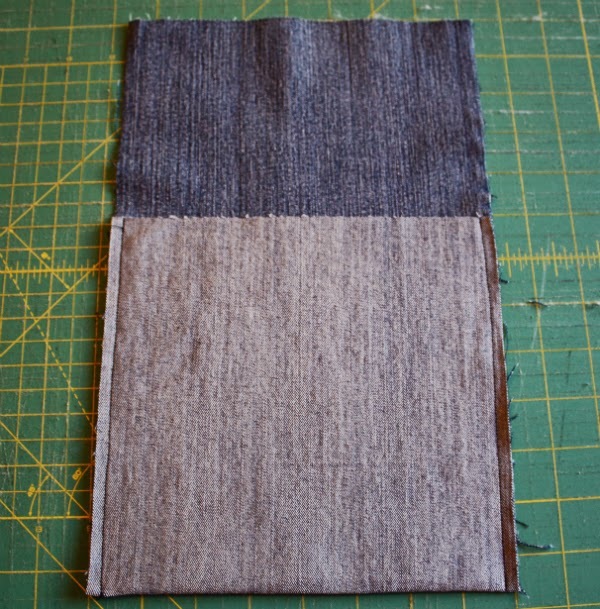 With the right side facing up, fold up the bottom, leaving 5" at the top. 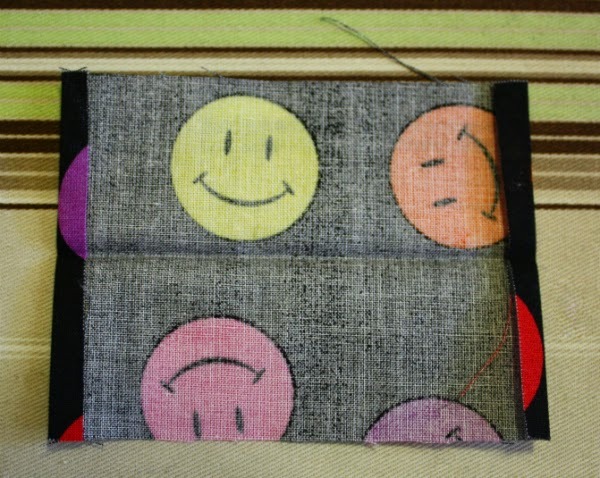 Pin and stitch both sides with a 1/4" seam. 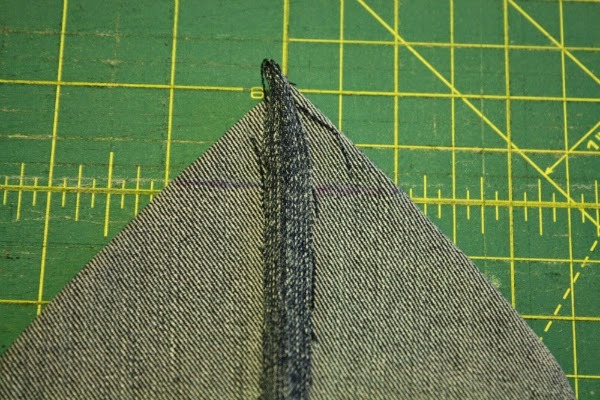 To press the seam, fold back the top side of the seam allowance and press. Then flip the pouch over and repeat with the other side. 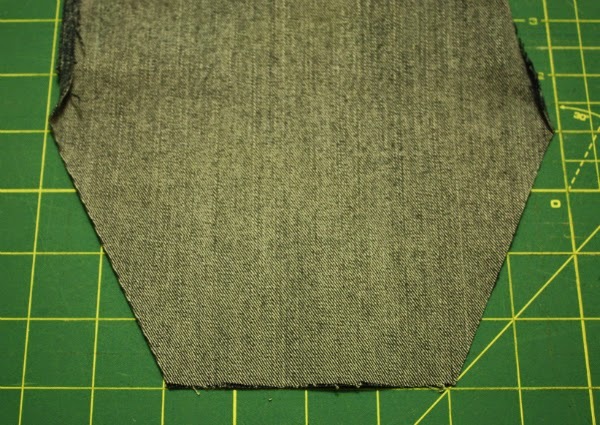 To box the corners, align the side seam with the center of the pouch bottom, forming a triangle. Draw a line 1" from the tip of the triangle. 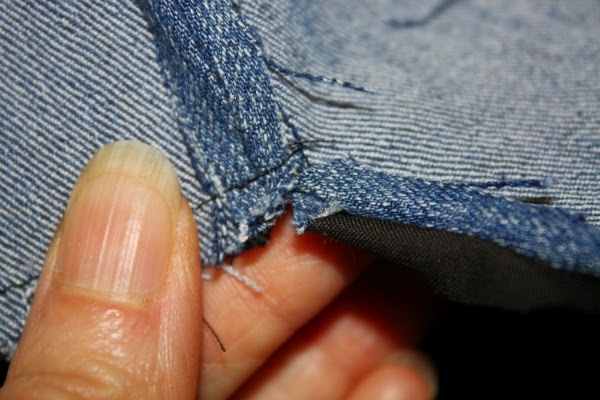 Stitch on the line, then trim away the excess 1/4" from the seam. 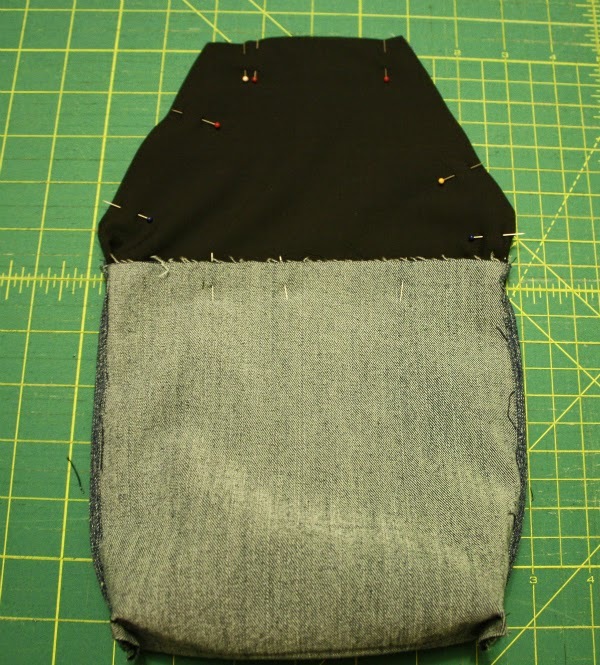 To create the shape of the flap, measure in 2" from the side at the top of the bag and cut an angled line to just above the side seam. 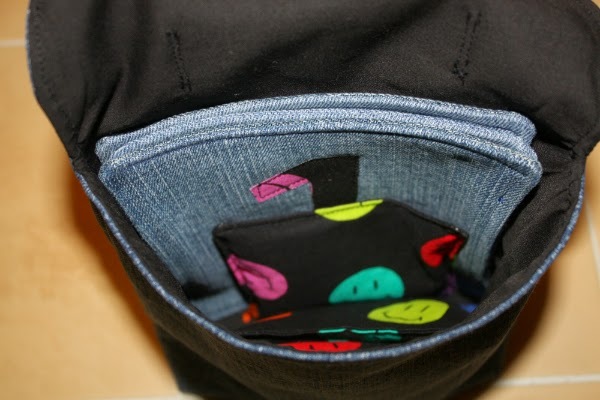 With the denim pouch wrong side out, insert the lining with the right sides facing. Pin around the flap and the top of the pouch. I use two pins together to remind myself to leave a gap for turning the pouch right side out. So, in this picture, I would start stitching at the red pin at the top right, then stop at the two pins together at the top left. 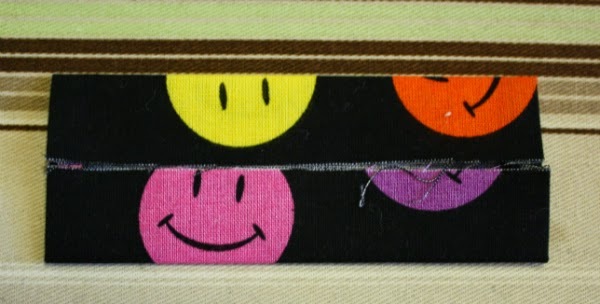 Stitch with a 1/4" seam, leaving a gap for turning. 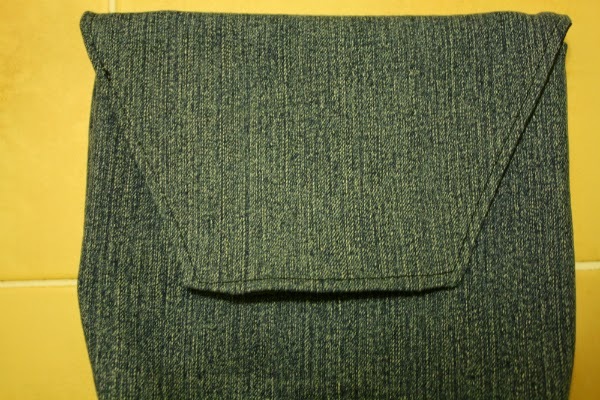 Cut out a notch where the flap meets the side of the bag, to help the fabric lay flat once it is turned right side out. Be careful not to cut through the seam! Turn the bag right side out through the gap. Press around the flap and the top of the bag. 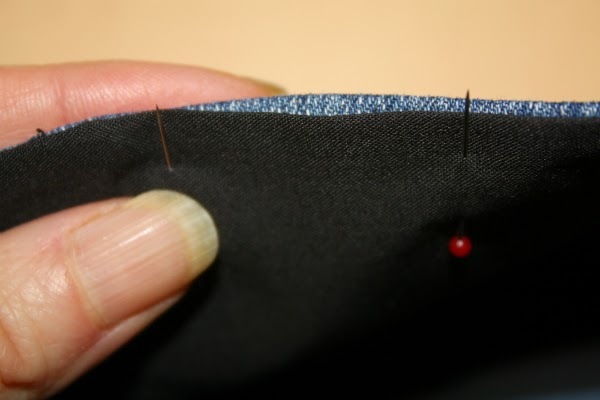 Press the seam allowance under in the gap and pin. Stitching close to the edge, topstitch around the flap and the top of the bag. Stand the bag up and center the handle at the top. 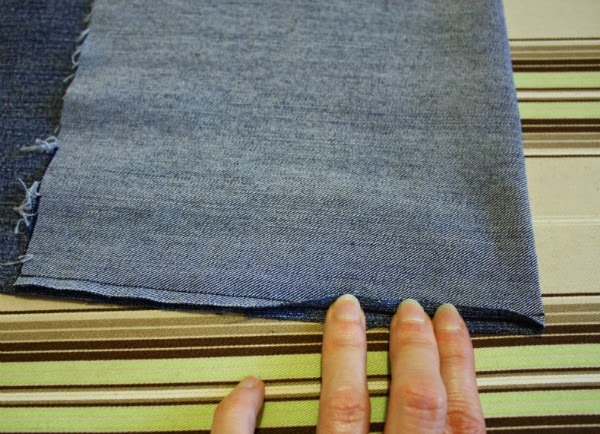 You don't want it laying completely flat, so leave a bit of a bump in the middle and pin the two sides. Stitch two lines close together near both short sides of the handle, backstitching a couple of times at the beginning and end of each line of stitching to be sure it will hold securely. If you make one, I'd love to see it! Email me a picture, or tag me on Instagram (@devotedquilter). So fun! Great tutorial, too! 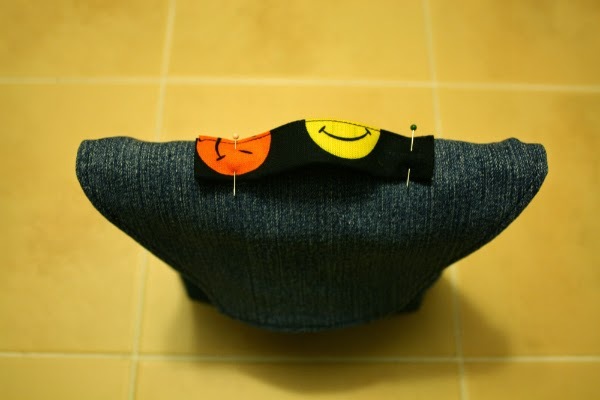 Very cute bag, and great use for old jeans! What a cute bag! 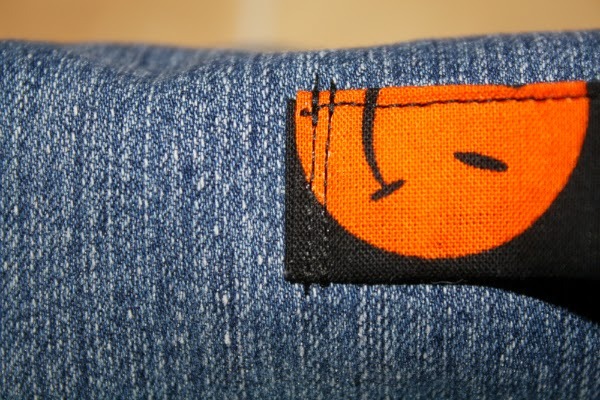 A great use of some old jeans and a fun focus fabric. Thanks so much for sharing the tutorial, Leanne! What a fun tutorial! And love the idea of using old jeans!